I’ve been reading John Berger’s book, The Shape of a Pocket. 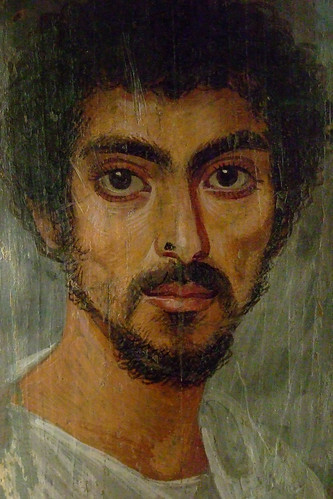 In it there’s an essay on the Fayum portraits. 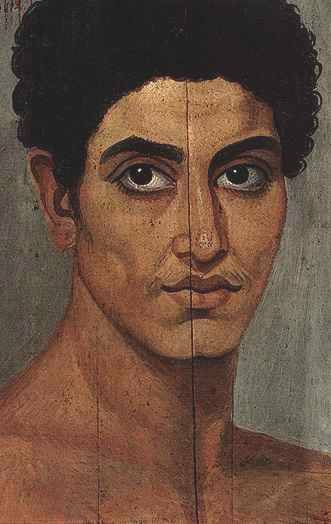 During the 1st to 3rd century AD in Egypt, painted panel portraits (more commonly referred to as Fayoum or Fayum portraits) were bandaged over the heads of mummies. These astonishing portraits depict the inhabitants of Greco-Roman ancient Egypt in exacting detail. They were finely executed in a beeswax-based paint on wood or stuccoed linen. 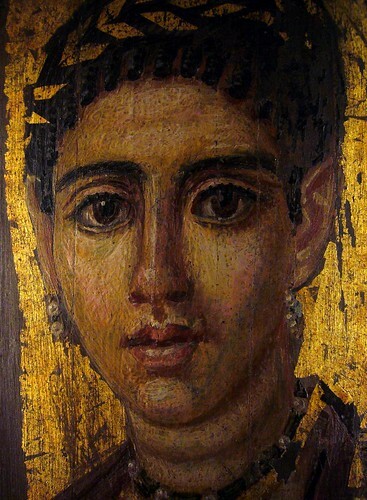 Imagine then what happens when somebody comes upon the silence of the Fayum faces and stops short. Images of men and women making no appeal whatsoever, asking for nothing, yet declaring themselves, and anybody who is looking at them, alive! They incarnate, frail as they are, a forgotten self-respect. They confirm, despite everything, that life was and is a gift. The portraits were attached to burial mummies at the face, from which almost all have now been detached. They usually depict a single person, showing the head, or head and upper chest, viewed frontally. The background is always monochrome, sometimes with decorative elements. In terms of artistic tradition, the images clearly derive more from Graeco-Roman traditions than Egyptian ones. The population of the Faiyum area was greatly enhanced by a wave of Greek immigrants during the Ptolemaic period, initially by veteran soldiers who settled in the area. Two groups of portraits can be distinguished by technique: one of encaustic (wax) paintings, the other in tempera. The former are usually of higher quality. About 900 mummy portraits are known at present. The majority were found in the necropolis of Faiyum. Due to the hot dry Egyptian climate, the paintings are frequently very well preserved, often retaining their brilliant colours seemingly unfaded by time. We recognise that truth and it touches us. This truth does indeed touch us! It reminds us of our humanity and our vulnerability, and of the beauty and fragility of life. 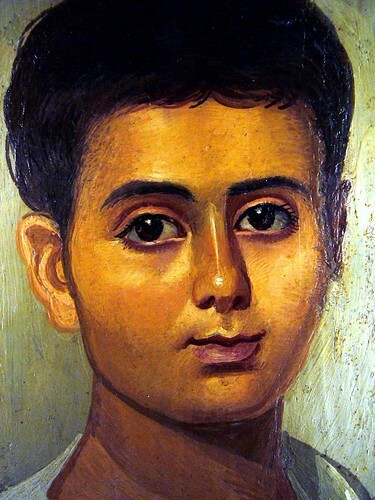 The Fayum portraits are wondrous! These are some of the most remarkable images I have ever seen. They belong in history classes. We must not treat those who came before as stick figures. The present will resonate with richer life if we bring the vibrancy of the past into our classrooms. I agree with all of you! In a painting class ,our teacher gave us photocopis of those portraits, we all enjoy very much to paint them, I did 3 of them ! Hello there! This post couldn’t be written much better! Going through this post reminds me of my previous roommate! He constantly kept talking about this. I am going to forward this article to him. Fairly certain he will have a great read. Thanks for sharing! Thanks, Casey. Glad you enjoyed reading the post. I hope your roommate does, too.